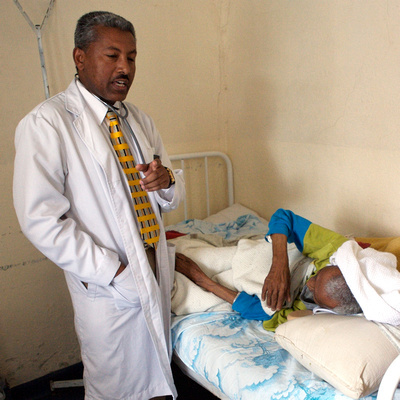 I'm conducting a site visit to LeAlem Higher Clinic in Addis Ababa, Ethiopia, on January 17-31, 2010. This is a scratchpad of thoughts for that trip, with background and draft vision and questions. Comments or suggestions on this blog, at Facebook, or email to me are welcome. We founded Ethiopia Healthcare Network (EHN), a 501(c)3 non-profit, in December 2008 and started the LeAlem project in October 2009. About two years ago, in November 2007, John Wimberly and I visited LeAlem and met its medical director, Dr. Alemayehu (Dinku) Gebrehiwot. When a clinic construction project we were working on -- the "Clinic at Dukem," south of Addis -- became ensnared by local politics early in 2008, we turned to Dr. A. to consider a different approach. We shifted from infrastructure development to healthcare delivery, in order to more immediately provide benefit to needful patients. Dinku (pictured above) is an amazing individual. He regularly works 12-14 hour days, seeing many tens of patients. He is noble, dedicated, smart and humble. With EHN support, LeAlem serves 100 additional patients each month, patients who cannot afford and would not otherwise receive professional care. EHN's October 2009 grant enabled LeAlem to hire an additional doctor, social worker and nurse. Our focus is mothers and children who do not have access to professional medical care. We do this because it concentrates resources and will help us achieve excellence, and because we believe children and their mothers are the seed corn and binding force of a community. As EHN grows, we'll likely have projects that support more broadly-based community healthcare, particularly in rural areas. This is a long-term effort, and we are only at the beginning of the beginning, a couple months into our first project. EHN is fortunate to be headquartered in Foggy Bottom, Washington, DC, near the White House and blocks from the State Department, international development organizations, and a major university and medical school. EHN's Board is an exceptional team of experts, individuals who were born in Ethiopia, generous patrons, and well-connected professionals. We envision the EHN "network" drawing upon resources in the Washington area and helping them to deliver value -- charity, healthcare -- a continent away, in a place orders of magnitude less fortunate. Beyond leveraging DC resources, in the long term we envision EHN clinics and projects across Ethiopia networking, working together and with regional resources, NGOs, government and other organizations to provide care, alleviate suffering and improve outcomes. So what's next? We have started a project that is delivering meaningful results (see link), at low cost. My focus and line of inquiry for the LeAlem visit will be on how we can help, how we can enable. How can we better serve the great mission of delivering medical care, relieving suffering, and improving outcomes -- while responsibly stewarding EHN resources and talents? What shared vision can we develop and support? While in Addis, I will meet with Dinku at length and meet with all the staff supported by EHN. I will shadow Dinku and his clinic, open to close, observing activity and interventions, and develop anecdotal case studies describing EHN-supported work and challenges. In addition, I'm scheduled to meet with NGO and government officials, and tour a few other medical and social work centers, including Biruh Tesfah (Bright Future), which cares for displaced girls and women, many from rural Ethiopia, and helps them develop skills and gain traction in the urban economy. Here are draft questions to explore at LeAlem. These will likely change based on research, feedback from partners, and cogitation. What is Dinku's vision for program expansion? How could we help with next steps? What are the limits of LeAlem's current capacity? Could Dinku envision working as a center of the EHN network, with additional clinics in Ethiopia, locations in Addis as well as rural areas? What scenarios are plausible? Would others be willing to take on roles in this area? What resources would be required? How would we identify new projects? Do any new projects come to mind? Considering different time frames -- one year, three years, five years -- how might the LeAlem program evolve? What additional resources make sense? Could a telemedicine program, with specialists from GWU online, be feasible? Would it make sense to rotate med students in with LeAlem, perhaps in combination with the large Black Lion hospital in Addis? Who are we serving? Where do the EHN LeAlem patients come from? Where do they go? Do LeAlem patients need and receive follow-up? What are post-treatment outcomes? What degree of the EHN work is preventative? Are there meaningful, additional community needs to be addressed -- sanitation, hygiene, education, housing, clean water -- needs that severely impact the outcome of LeAlem patient care? Can we make a difference here? How? What partners or coalition? Who are our partners? Are we collaborating with local government agencies, NGOs, family care providers, other health care providers? Should we work to strengthen relationships like these? What are the risks and benefits? Given our focus on women and children, is there more we can do? Gynecological/urological expertise? Neonatal? What are the most significant problems for this population? Can we do better? What vaccine programs are available for children? Pneumococcal vaccine? Could we partner with or help form an immunization program for client children? How does LeAlem handle HIV cases? Is there a referral structure (e.g., PEPFAR) that works? Are we connected to a program to prevent mother-to-child transmission (PMTCT) of HIV? Are there elements that EHN's current LeAlem project is missing? Equipment, medicines, infrastructure, staffing, management? How could we be better? Are there parts that are inefficient? Are we measuring the right things? How is the patient case tracking data valuable? Research, trend analysis, publication, quality assurance, follow-up, grants, government reports, support for fundraising? How can EHN volunteers help? Money, politics, collaboration, clinical or technological expertise, NGO contacts? Does it make senses for Dinku and/or LeAlem staff to come to the US, for advocacy, training or other reasons? These are a few topical areas, probably all weighty, we look forward to examining. Other logistical matters are well in play -- from lodging to setting up meetings in Addis with NGOs, diplomats and the like. Ideally, I'd like to return to DC with at least one or two pieces for publication, to help grow the charity. The end goal, the site visit purpose, is to help EHN learn how it can do more to deliver care to underserved patients, efficiently and effectively, and to gain assurance that our resources and talents are being well-applied.